Guitarist Mark McGuire’s first post-Emeralds solo album may take a few listens before you stop sniggering at the back. It’s an “odyssey through the vast, unknown regions of the mind”, according to the inner sleeve ‘preface’. There’s also an 8,000-word narrative arc in four chapters, in case McGuire’s meandering fretwork and ambient synth arpeggios don’t speak loudly enough. “This is the story that burns in the heart of all mankind; the quest of the individual seeking the answers to the great mysteries of life,” he proclaims, like he’s a wizened oracle in a paperback fantasy, not a floppy-haired 27-year-old from Cleveland. It’s red-rag bait for blog trolls the world over, but if you bypass the new age synth signposts, McGuire’s “journey” is more than just a concept art postcard from a ’70s prog landscape. In the preface, McGuire posits that all our actions are “unconsciously (and sometimes consciously) guided by all of past experiences, computing like a vast string of cosmic integers”, and Along The Way does share many of the traits of his colossal back catalogue of 70-odd albums and EPs. 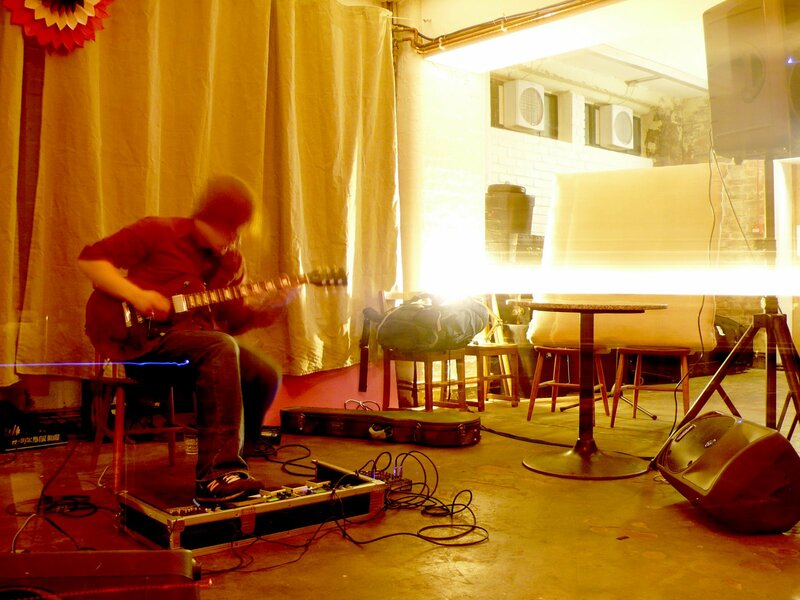 The repetitive guitar motifs and effects-laden abstract solos will hook fans of post-rock/drone/ambient trio Emeralds, but he’s taken a Prince-like approach to the recording here – commanding live bass, talk box, drum machines, synths, piano, mandolin and electronic effects, a “layering of real instruments over fake versions of themselves”. Opening with simple strums on Awakening, Part I chimes with optimism, all Eastern hues, electronic light flecks and choral effects, and this relentlessly upbeat vibe carries through the record’s 68 minutes – even when our protagonist’s spiritual development is stunted by “agents of destruction” in Part II: The Age of Revealing. McGuire is a reluctant virtuoso — renouncing rock guitar histrionics in his extended solos to spin expressionist webs from the songbooks of Manuel Gottsching, Neu! and Tangerine Dream, and the slightest hint of The Edge’s guitar flutter. Along the Way makes most sense when it strikes with urgency – as on the 12-minute pivotal track The Instinct, whose muted Global Communication-style fret pitter-patter makes way for a drum machine martial beat and panning guitar solo, like the Alan Parsons Project reworking a Rocky montage. Too often though, the album trips over its own assumed serenity. Tracks like Arrival Begins the Next Day and The War on Consciousness could be the soundtrack to your aunt’s spa retreat, and the talk box-heavy The Lonelier Way is Daft Punk having a soft-focus Radox moment. The greatest ambient works carry a hint of dread – think Aphex Twin’s shape-shifting clangs and murmurs, KLF’s apocalyptic radio sermons or Autechre’s geometric sonic mazes. There’s no jeopardy in Along The Way – it ebbs and glistens like a perpetual springtime, but a few storm clouds should’ve cast some contrasting shadows. It’s pretty, but it could get pretty tiresome after a while.